Hurricanes have forced Florida State University student Meghan Lawlor to evacuate twice in as many years, but Michael took her by surprise. COLD SPRING, Ky. -- Imagine starting a vacation in Florida’s panhandle, then having to quickly pack up and get out of the way of a hurricane. That’s exactly what happened to a number of families from Cold Spring this week. Megan McCloskey, her husband, their three children and a family friend settled in on Saturday for a long-anticipated vacation in Panama City. Hours later, they were packing up and heading home to avoid a monster storm. McCloskey spent time Wednesday checking out live TV coverage of Hurricane Michael ripping into Panama City. She was stunned at what she saw and glad her family was safe. “Definitely dodged a bullet,” she said. “When you hear where it could possibly land, you always kind of think it won’t hit where we are exactly, but this time it did." They arrived in Panama City knowing a storm was brewing in the Gulf of Mexico -- a tropical storm that could become a hurricane. “By Monday afternoon, after we had eaten lunch and gotten back to the condo, my friend’s husband came up and said they were talking about evacuating the condo by 6 the next morning,” McCloskey said. The mandatory evacuation notice that followed prompted an easy family decision. “Luckily, we hadn’t unpacked a lot, so we just kind of packed back up and got all the kids back in the car and headed back north,” McCloskey said. The McCloskeys didn’t have insurance for their trip, but they didn’t lose everything. “Because it was a mandatory evacuation, they credited the nights Tuesday through Saturday night and they actually canceled our flight, so they refunded all the fees for that, too,” she said. As the storm raged, there was no doubt the McCloskeys felt fortunate. “Definitely,” she said. “I never would have imagined it would have got this bad, but definitely glad that we are not down there experiencing that right now. The family plans to return to Panama City next year -- with a close eye on the weather. 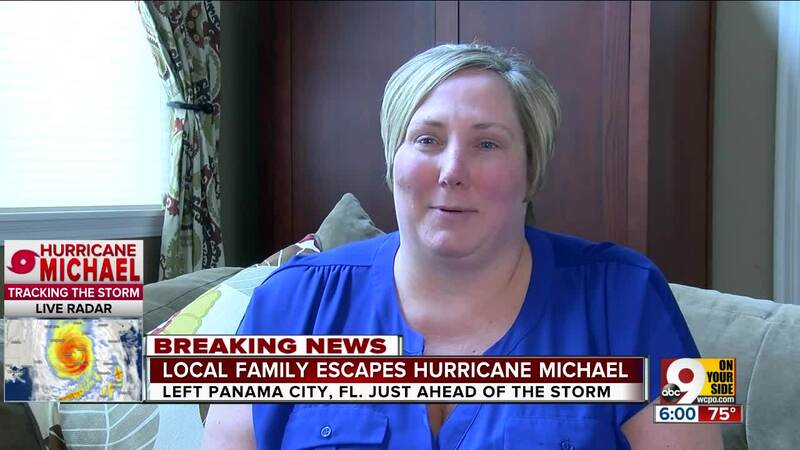 Hurricanes have forced Florida State University student Meghan Lawlor to evacuate twice in as many years, but Michael took her by surprise. Like McCloskey, she and her classmates knew a storm was coming. They just didn't expect it to be so severe, she said. "I was in class on Monday, hadn’t really heard too much about the storm, and then all of a sudden someone yelled out that class was canceled for the rest of the week," she said. Lawlor, a native of Greater Cincinnati, knew almost immediately she couldn't stay in her apartment and hope to ride out the storm. She returned home, and she said Wednesday night no one at her school was sure when classes would resume. "I think right now we’re all just kind of waiting to see the damage that is done once it’s complete," she said.